Lang Ngon Restaurant is located in Nha Trang city on a total area of over 3000m2, hidden under the tree with hundreds of years old shady. Lang Ngon restaurant appears as a miniature of an ancient village in the North, Vietnam old but charming. A space full of memories cares for every detail. Gateway carved meticulously, tile roof moss map. Entering the restaurant space is a large yard, intermingled with the ancient house, a brown curved roof is an image decorated as close as buffalo, banana, lotus pond. Sitting in a restaurant can dine with nature and relax the soul of romantic adventure. 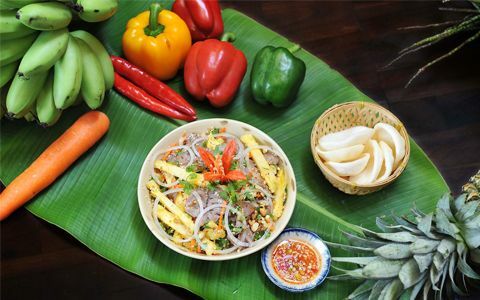 Menu with nearly 300 special dishes, is the essence of Vietnamese cuisine, the cultural imprints and people from all over the land of the S shape. From Bun noodle, vermicelli, noodles noodle soup, noodle soup, Hue beef noodles, cake spring rolls, the cake to ask the pig of the Central to the dishes flavored with the South such as Southern-style noodles, Braised fish. The menu of the restaurant certainly can not lack the specialties of Nha Trang such as cake baskets, fish noodles, spring rolls, and especially fresh seafood. The food Lang Ngon restaurant is richer with a full range of alacarte from baked goods, to hot pot dishes, lunch menus and nutritious dishes, good for health. Enjoy the delicious dishes that are traditionally displayed in the "Vietnamese" way right at Nieu Com Nuong Nha Trang restaurant. Located in the heart of Nha Trang city, Ngoc Trai Restaurant is an ideal place for formal meetings, meaningful parties for guests.